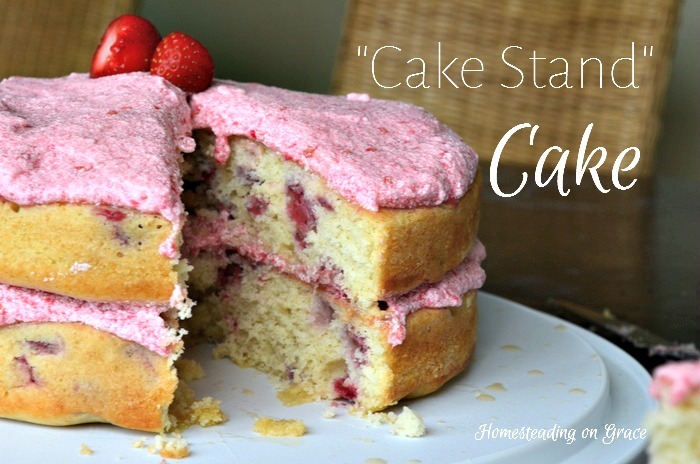 Make sure you check out the bottom of this post to find out how you can make amazing cakes too! I baked a cake. From scratch. With sugar I don't have to worry about. And it didn't turn out terrible! It wasn't hard. It wasn't an altar to the dead. Yes. It was awful. It looked like I had sacrificed a young bull to Zeus. Isn't it gorgeous?! I'm so pleased! I followed Quinn's directions, I read the whole book first, and it worked. It's light, and fluffy, and delicious! Eowyn and I made it together for our Memorial Day party. It's the Strawberry Chamomile Cake. Tada! We measured out the butter and used evaporated cane juice sugar, just like Quinn suggests. Then we beat those until they were light and fluffy. This was the most stressful part. The recipe calls for 6 egg whites and one whole egg. Eowyn very carefully separated the egg whites and egg yolks. Apparently, she practices when she makes scrambled eggs. She only made one mistake, which was fine because one of the eggs had to be whole. While Eowyn was working on the eggs, I prepared the pans. Softened butter and flour, just like Quinn says. Now for the flour. Quinn suggests fluffing up the flour before measuring. So I poured a bunch of flour in a bowl and fluffed it up. Then we scooped, and scraped with the flat of a butter knife. We whisked in the baking powder and salt and measured out the milk. You have to slowly add some flour, then some milk, and then some more flour, and some more milk, and then the last of the flour. We scraped down the sides of the bowl and then mixed it up for a few more seconds. The batter was beautiful! White and fluffy (I kept crying out, "IT'S SO FLUFFY!") and, yes, it was delicious. Then I carefully folded in the strawberries we had cut up and split the dough between the two pans. I baked it for 35 minutes, it didn't look done at 30, and did the toothpick test to make sure it was done. Then we left them in the pans for 10 minutes, per Quinn's instructions. Now it was time to flip. I was a little worried! But they slid right out of those pans without any sticking! Cue the angels singing. We left them to cool overnight, and in the morning, we whipped up Quinn's berry buttercream frosting and the chamomile syrup. We brushed the syrup on the cakes, and then iced them up. And can you believe it looks (almost) just like the picture in Quinn's book? I'm going to be happy dancing about this cake all week. 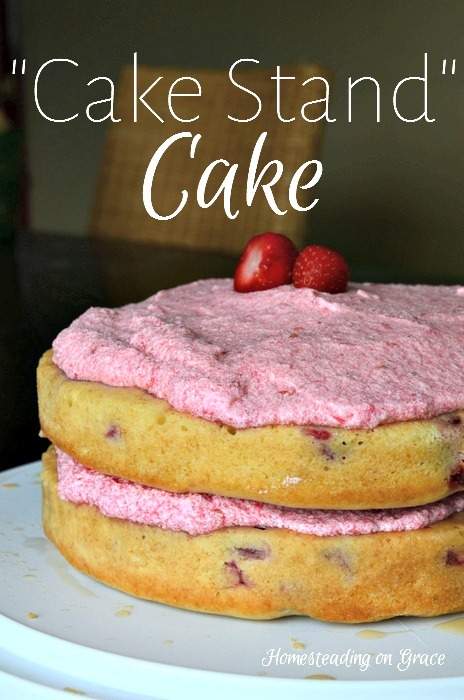 Cake Stand has 30 beautiful cake recipes! I am set for all the kids' birthday parties. One of the things I love about this book is that there are cakes for every season. Quinn doesn't market it as a seasonal cake book, but there are strawberries for the spring, peach, pear, grape cakes for the summer, apple cakes for the fall, and even a kale cake for the winter. We made the strawberry chamomile because we're coming to the end of our strawberry season, but Eowyn's already debating about which one she wants for her birthday in July. PS If you'd like an idea of what to do with all those egg yolks, I made up some Strawberry Lemonade Egg Yolk Cookies. Here's the recipe! This looks so good and much better than your previous attempt at "cake" haha. We have tons of strawberries I'm trying to figure out what to do with. Perhaps I'll break down and turn on the oven, I'm sure we would love this.